STACCO is a smoldering stainless glow, with a multi directional textured pattern, which can handle hard playing without scratching. Has interesting fractures of light reflects. Similar to a pearloid effect, but in shiny gleaming metal. Polished 100% non-magnetic stainless steel, corrosion free. FITS -Any genuine Fender USA & MiM Strats from 1986 to present. 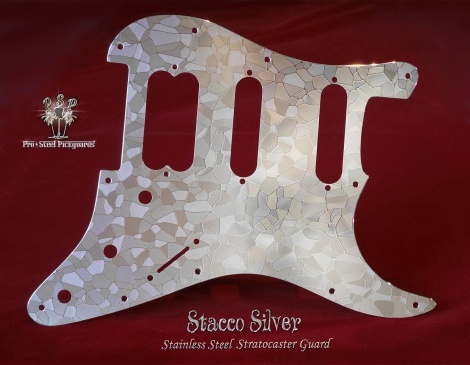 Any Strat which a current Fender Strat guard fits. Before '86 there may be deviation in some Fender screw hole placements.